August 2009. Comments have been made about this section on TMI. Everything written in 2002 was true. We hope before the end of this year, to visit this facility and update this entry. We understand that is has expanded to include some 50 children with autism-related problems and some 15 young children with vision-problems, and that it has better quality staff than in the past. August 2009. Comments made about Hope School at the time this was written, were all true. We accept that certain aspects may have changed in the interim, and we hope to update this section by the end of 2009. 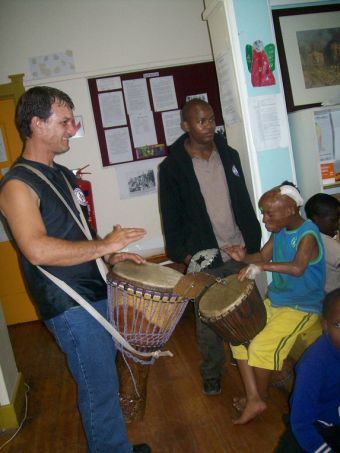 On Monday 29th March 2010, the Johannesburg School for the Blind, [at cnr St Swithin's Avenue and Lothbury Road, Auckland Park 2092], will be hosting the first of four African-themed days. The children will learn about the beautiful continent they live on, as well as who and what the African Union is. 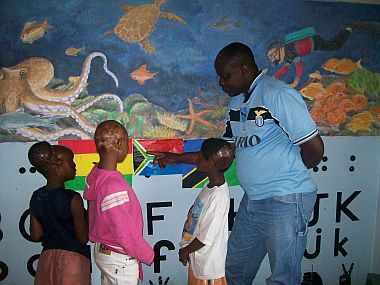 At 10:30 the children will be helped by the teachers to fabric-paint T-shirts with all the colours of Africa. The theme 'Africa My Continent' rings true for many South Africans, as we are a mix of many nations. 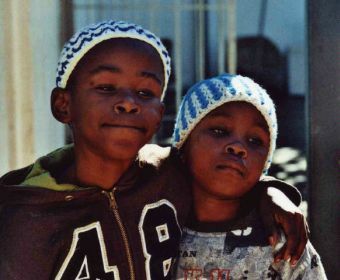 Principal Mortain Dube, of The School for Blind and Multiple Disability Children, feels strongly about educating South African children about Africa, in the hopes of preventing xenophobia within and beyond South Africa. Principal Mortain Dube with thee of his pupils. Nkululeko on the far left is undergoing tissue expansion of his scalp. Above the children is an artwork by renowned Ndebele muralist Johannes Mahlangu. On Tuesday 30th March 2010, Johannesburg School for the Blind pupils, [Corner of St Swithin's Avenue and Lothbury Road, Auckland Park 2092], as well as visiting children, will go to The National Children's Theatre at 3 Junction Avenue, Parktown, to watch the play, Heidi, setting off at 09h30 and returning around 12 noon. Heidi was an orphan and so are many of the children, so they'll empathise with the heroine of the story. For further information please contact Michael Wessels on 011 726 6529. Thanks to Ossewa Antiques for arranging transport. Two of our blind pupils, Nhlanhla Mpisi and Khanayisile Nksi at the National Children's Theatre, checking out the Alpine story props before their visit this coming week. Pre-Soccer World Cup Fun for the Blind. 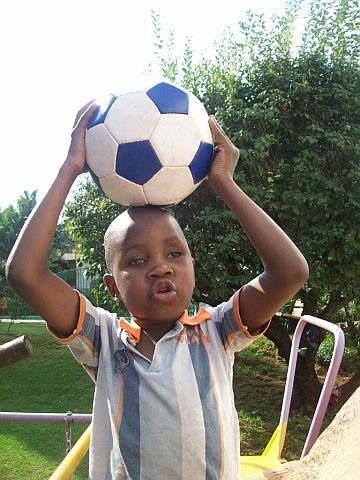 On the Wednesday 31st March 2010, The Johannesburg School for the Blind, [Corner of Swithin's Avenue and Lothbury Road Auckland Park 2092], will be hosting a fun-filled soccer day. The children will be learning about which African teams are playing in the 2010 Soccer World Cup. 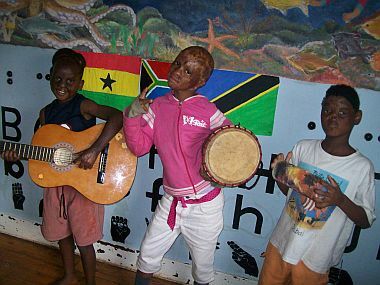 At 10:30 they will be painting the African countries' flags and doing some tactile art. There will be some soccer challenges and possibly some budding soccer stars. For further information or to join us please contact Michael Wessels on 011 726 6529 or Mortain Dube on 011 482 5270. School for Blind plays Music for Your Ears. 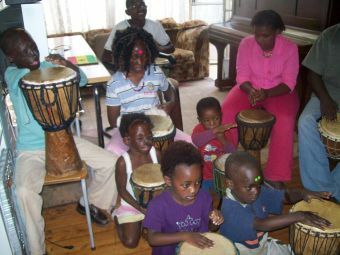 On Thursday the 1st April 2010, Johannesburg School for Blind, Low Vision and Multiple Disability Children, [based at Corner of St Swithin's Avenue and Lothbury Road in Auckland Park 2092], will be hosting a musically-filled African Easter day. 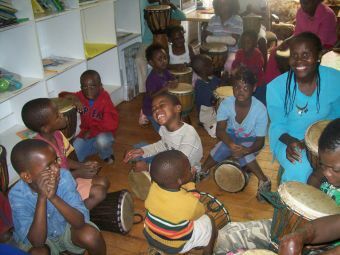 At 10:30 a South African band arranged through Mlue Records, will come and play music with the children, and there will be Easter egg beading and an Easter egg hunt. Some of the burned children who also attend the school, will get the beneficial foot therapy called Reflexology, from Sue Richardson from Midrand. For further information or to join us please contact Michael Wessels on 011 726 6529. Reconstructing problem areas of the house has just one advantage: it allows for tactile learning by the children of concepts like electrical fencing and plastering, that they would never normally get to feel. August 2008. 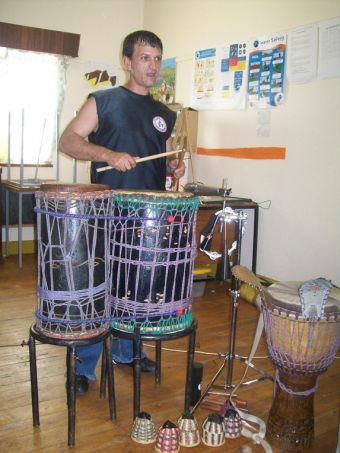 Drumming is an essential part of music at Jo'burg School for the Blind. 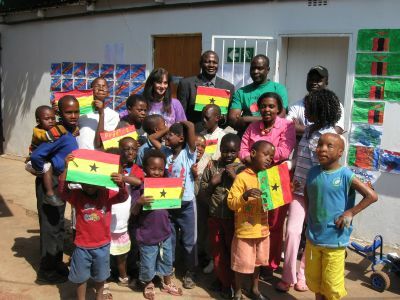 Mr Ibrahim Abass, the acting High Commissioner for Ghana, visited Johannesburg School for the Blind on 3rd April 2009, helping the children to celebrate their Africa My Continent week. are in Johannesburg awaiting surgery or recovering from surgery]. 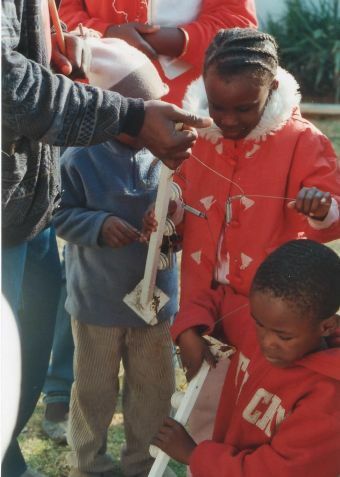 Pictured here - some of our kids on a sensory outing today � the Cradle of Humankind is a great learning experience for any pupil. But for blind, low vision and otherwise-disabled children, they really like to get out and about to experience things first-hand. Our teachers are going to provide feedback as to how to make the exhibitions even more interactive� listening to a fountain is great, but the blind kids want to immerse their hands in it as well�. 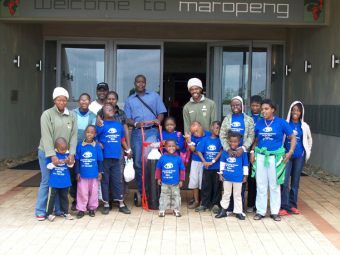 We think all schools should put the Maropeng Education Centre on their map of activities for the school year. 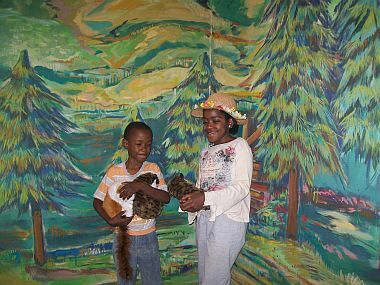 We hope to take some 40 children to visit there again in March 2009. 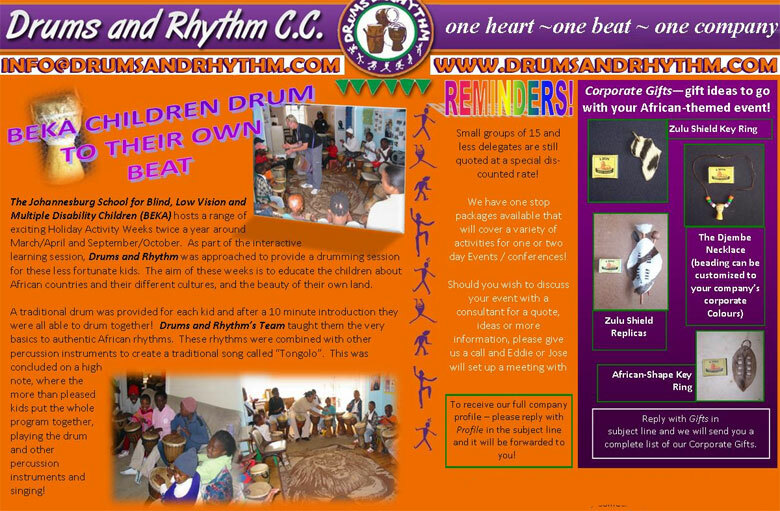 The Johannesburg School for Blind Children with or without other disabilities. 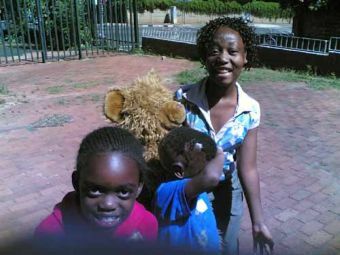 There is no school in Greater Johannesburg for children of low vision, no vision, and for those children who have other disabilities in addition to blindness. The metropolis is home to at least four million people. Children of Fire International and the Children of Fire Trust intend to be the catalyst to start such a school, but not to run it. 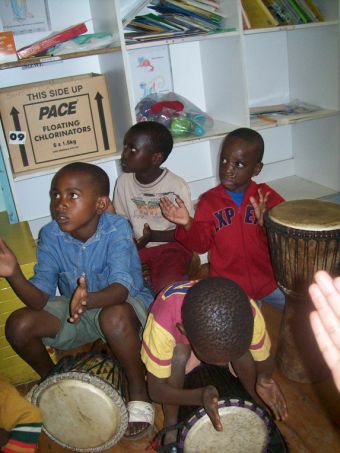 Input from all interested parties  teachers, therapists, parents, would be appreciated to: firechildren@icon.co.za or to PO Box 1048, Auckland Park 2006, South Africa. The school should be funded by the South African Governments Department of Education but the charities will help the DOE to seek expertise and supplementary funding from businesses and other charities, to improve upon what the government is willing to provide. Businesses that have shown provisional support are the African Merchant Bank, the Nedcor Foundation and Hirsch Furniture Stores. Currently the Government is not willing to provide anything but in October 2002 Bronwen Jones of Children of Fire held a nearly four hour meeting with chief education specialists Khatija Okeke and Mkhuseli Nanise from the National Department of Education. She is optimistic that a logjam of negativity may have started to move. Mr Nanise is blind but had sufficient vision when he was young, to be able to learn at a normal school. 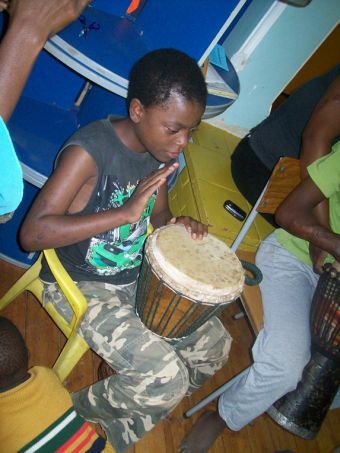 He and his colleague were very understanding about the plight of children like Dorah (see website). 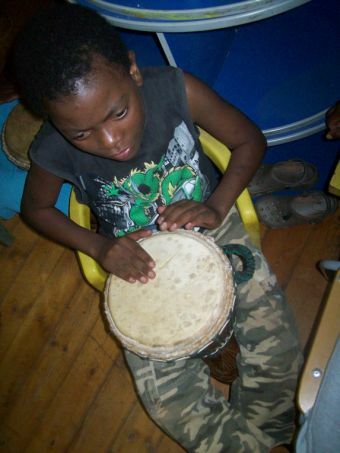 Many blind children have more than one disability and contrary to popular belief, lack of sight does not give children better hearing or better use of other senses as a result. 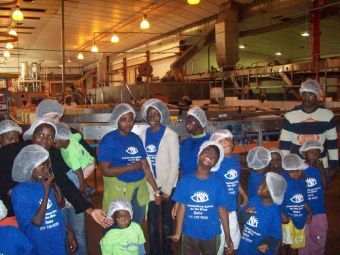 However, many blind children given the best chance since birth, achieve great heights in their personal and professional lives. There is at least one blind MP in the South African Parliament, a blind Cabinet Minister in the UK Parliament and famous musicians like Stevie Wonder are also blind. There are more options open than just becoming piano tuners and telephone receptionists. 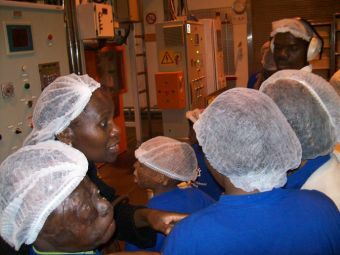 If a child is born blind in Johannesburg, they might get a place, briefly, to attend the visually impaired crèche located at The Memorial Institute (TMI), a former hospital, on the edge of Parktown and Hillbrow. 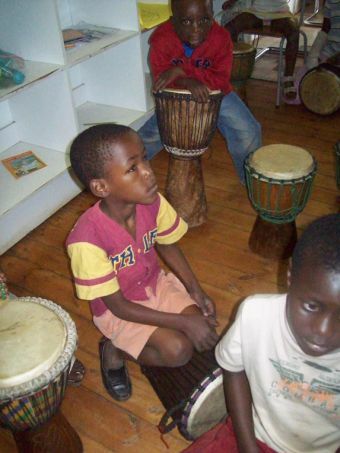 There is little positive to be said about this unit in 2002 (see Gauteng Schools section of website) but even if it was good at helping children to learn and develop, they would still have to move to Pretoria, Kliprivier, Katlehong or further afield, at the age of seven years. The child must either go there alone or the whole family must be uprooted to another town or city. This is often not possible, particularly when there is parental employment, or there are other siblings, to consider. Boarding school is rarely the best option for any child, but it should be the last option for a blind child, no matter how good the school is. The child grows up, hopefully, in a loving, secure family environment. He/she knows the layout of their bedroom, their house, maybe even the layout of the street. She has siblings and other relatives who play with her on an equal status. She is expected to take a part in family chores, whether it is making her own bed or in washing dishes. She understands the language that is spoken at home. This little girl or boy may get some education as a toddler (and early intervention is even more vital for children who dont see), but with or without that start, it makes no sense that they are then expected to flourish in a place far from all normal family support and with the teaching usually in Afrikaans, unless this was their first language. It is a strange quirk of history in South Africa that schools for blind children seem to be Afrikaans and schools for deaf children seem to be English. So the deaf child from a Free State farm may attend St Vincents School for the Deaf in Johannesburg and when he goes home in the holidays, his family speak Afrikaans so he cant even try to lip-read what they are saying, and only very rarely have they learned to sign with their child. If he hadnt been sent to a boarding school, maybe the parents could have been more directly involved in his and their own education. Schools like Prinzhof in Pretoria or the Pioneer School in Worcester (in the Cape) claim to be bilingual but the staff answer the phone in Afrikaans, speak to each other in Afrikaans and have (on our visits) had posters on the walls entirely in Afrikaans. Some of the staff struggle to speak English. So a little blind child in Johannesburg could leave a secure home and the language they knew and start life afresh in a totally alien environment. It would be traumatic. The schools that exist for blind children also vary greatly in quality. There seems to be a general policy of "dumbing down" or treating the disabled as if they were born stupid rather than born with potential. The best option in the country seems to be the Pioneer School in Worcester (near Cape Town). Some schools do not even attempt to teach children Braille; some schools have never even heard of the simpler version of raised symbol language, called Moon. Some schools mix sighted and blind children, even when they are meant to be dedicated places for the blind. In a day facility this might be an advantage; in a boarding school it is a hazard and can (and does) even lead to abuse. On a visit to Prinzhof a couple of years back, a little boy walked up to trustee Bronwen Jones and asked if he could play with the car keys in her hand. She asked why he was there and the staff answered: Because hes blind. But he could see well. Another little girl has been placed in the Pioneer school, not because she cannot see, but because social workers think she is too ugly to look at. We arranged for the child to have an eye test in August 2001 and the optician confirmed that there is no need for her to be in a school for the blind. At Sibonile in Kliprivier, the aspirations of the staff for their pupils seem very low. It is a boarding facility with the "housemothers" seeming to understand hygiene to the extent that they don't want the children to play as children normally do, because it will make extra washing for them. However while Dorah (see website) attended the school briefly, we learned that there were children still in their teenage years who regularly soiled their beds but no one was trying to teach them and their families how the children could be continent. There were also no washable mattress covers so the mattresses became more and more of a health concern as time went on. The list of horror stories at various children's homes and schools for the blind could be very long - even including a blind girl aged five who was burned to death in a hot bath as punishment for bedwetting. So we believe strongly in keeping children with their families, educating the families to help their own children, and letting the child attend a good school with special facilities and well-trained inspired teachers, on a daily basis. We believe however that a significant number of blind, low vision and children with other disabilities get no schooling at all. (In fact a large number of perfectly able South African children get no schooling at all). But if a blind child gets a good education, she can have some chance at independence, even a chance to earn her own living as an adult. So not only do these children have a Constitutional right to education, but it makes moral and economic sense to provide it. We need to start a Johannesburg-based primary school for children who cannot see much and who may also have other disabilities. It should start with one class of approximately Grade One children (accepting that they may have very different backgrounds and learning abilities) and one Grade R, reception class. There should be sufficient space and finance for teaching staff to take this initial intake through to Grade 7  i.e. to 12 years old or a little older. The school should be English-medium with assistance in at least Zulu and Sesotho from classroom assistants. There are schools already in Johannesburg (many private or part-private) that cater for children with autism, cerebral palsy, physical disability and mild mental impairment. But none of these will accept children who cannot see. Forest Town (cerebral palsy) has accepted one girl who has low vision (but sufficient vision to recognise people across a room) because she also has floppy limbs: We understand that the girls elder sister attends Prinzhof but that the younger one was turned away  a paediatrician hinted at HIV status but declined to explain the reason. It would have seemed logical and humane to have two sisters in the same boarding school if one had to attend there in any case. 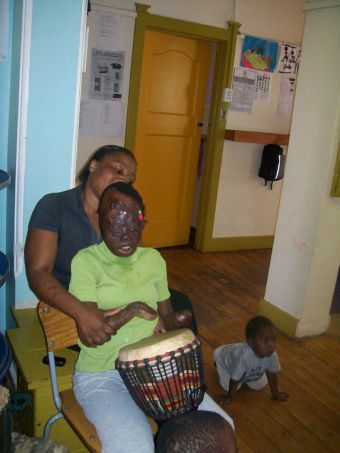 The fees of certain of the private schools catering for some form of disability are prohibitive - and are updated on the Children of Fire website as time permits. The new primary school should ideally be located near to existing public transport facilities  e.g. main kombi-taxi routes, buses (though these are infrequent in Johannesburg) and maybe even the new Gautrain route  so that most of the parents without cars can get there easily. It should also consider other schools and facilities in the area to see if it could share buses or similar (as run by schools like Doug Whitehead (Kensington) that pick up children from as far away as Auckland Park). It might even be possible to negotiate with a school like the German School to use its extensive bus route system that spreads right across the city, even to Soweto. The schools running costs should mostly be funded by the provincial education department. The Gauteng Department of Education (GDE) has a duty to educate children and there was a pledge in the media in 2001 that pupils who excel in science and mathematics could be supported at private schools with the same fees that it cost to keep them in state schools. It would be reasonable to have that same allocation from GDE towards each pupil in the new primary school for the blind, even though it would not be enough to fund the teacher/pupil ratio needed, let alone support staff such as physiotherapists, occupational therapists, speech therapists, or simply classroom assistants. Some privately-run schools like the Foundation School in Melville (initially a bridging facility to mainstream education) got R800 a year per pupil contribution from government. This is not enough. SA government education policy now aims for inclusion of disabled children in mainstream education. On one level this is wonderful but in reality it cannot often work, primarily because of poor teacher training in the first place or inappropriate facilities, or both. With the excessive pupil numbers in the classes, it is also impossible to give disabled children the attention that they need. However, if teachers can be taught how to teach a blind child and a sighted child the same subject, inclusion of at least low-vision children in mainstream schooling might be possible. It can be as simple as providing spectacles, magnifying devices, sitting an impaired vision child at the front of the class, and obtaining large print publications. In some schools the child learns with other children but, because of physical problems, they are given an adult to write their exams with the child dictating the answers for the adult to write down. The high cost of providing one-to-one help is limited only to exam time. The new Johannesburg primary school for the blind should carry out teacher training for half of December, at least one week around the Easter break and for at least half of July. This would maximise use of the facilities, spread vital knowledge and also ensure that the pupils can attend school for longer than pupils at other schools. Blind children, especially very young ones and especially those with additional disabilities, are very hard work to look after well. It is easy for children to regress if the breaks from school are too long. Parents, particularly working parents, need more support than the normal school year would provide. Educators estimate that looking after a blind child is the equivalent of looking after six normal children. 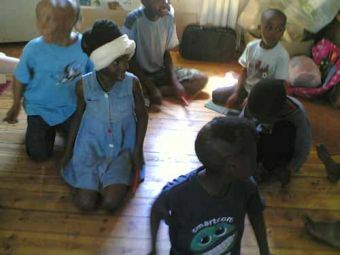 Ones with additional disabilities like Dorah (see website) can be equated to looking after ten ordinary children. Some children may not be very mobile and so could just be left in the corner at home, doing nothing much at all. This can be through lack of parental awareness, or family exhaustion/depression, or family indifference. It should be obligatory for parents to attend short course at the school to also know how to help their children most effectively, and for a teacher or other professional to visit each family at home to help them maximise the childs potential in the home environment. There are very few teachers in South Africa with appropriate skills, experience and most of all, the will. One would start with a small core of people who have either already worked with blind children or who have related skills and are prepared to train and make a long-term commitment. It might be appropriate to ask the Danish government to sponsor a specialist like Lilli Nielsen to visit and train people for a solid month, two weeks with the children in place, and to then return three months later for another batch of training and to help adjust methods, classroom layout, etc to fit the needs that became evident in the interim period. There is a need to get blind children to move with confidence. This can require the skills of occupational therapists or physiotherapists. Sometimes the lack of movement before attending school leaves the child with muscle weakness that can be fixed by regular work with a physiotherapist  but that might mean individual weekly sessions for a year  ideally with some family member involved as well, so they learn how to help their own child. If children have other disabilities  from birth or from injuries  occupational therapists can devise prosthesis to, e.g. overcome lack of dexterity or lack of limb movement. Speech therapists for particular children would need to work one-to-one. It could be possible to link with an academic programme such as for occupational therapy students from Wits University, but people dipping in and out of childrens lives can be very disruptive and do more harm than good. Whoever is in touch with the children should make a regular commitment, ideally for at least six months at one day a week, preferably for longer. It might also be feasible to contact large organisations like Netcare Rehabilitation (Auckland Park) and see if they can second staff like physios and speech therapists for one day a week. But being cheapskate will not help the children, so a budget should be included for professional help at market rates. What special facilities are needed? It is worth spending more on the early design and construction of a school to make an ideal learning facility for the blind. A few of these concepts are detailed on the Children of Fire (burns charity) website under the sections titled: Tsephos Project and Dorah House. The school should be on one level unless it is making use of an existing building, in which case upper floor(s) could be used for administration, storage, and in-service teaching for inclusion projects in mainstream education. Corridors and doorways should be wide enough for wheelchairs and if there are any steps there must also be adjacent ramps. There should be guide rails around the whole building, at a height that is easy for a child of seven to reach. There should be complimentary painting or choice of building materials to easily differentiate walls and floors, entrances and the like. E.g. If doors are painted white, the doorframes should be painted dark red. 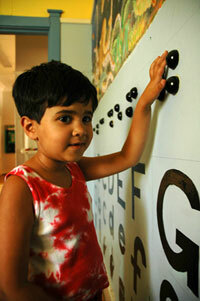 Many children with low vision can orientate themselves through such landmarks. Likewise, a greenhouse effect of surrounding children with light is not helpful. But windows on two walls of a four-wall room, the windows of very different shapes, help a child to know that is she walks towards the big circle of light, thats the way to the bathroom, and if she walks alongside the big rectangle of light, thats the way to the playground. Textured surfaces also help. In some cities paving stones have been installed next to pedestrian crossings that are covered in a series of round bumps. These, and beeping signals when a button is pressed, indicate that it is a safe place to cross the road. It doesnt take account of the people who jump traffic lights, but the concept is solid. Even the soil of pathways and gardens can be chosen to maximise independence. A light sandy path next to a dark soil flowerbed, can be seen by many low vision children. There can be rope guiderails and even water features and wind chimes to help guide children. The choice of plant scents and textures also help. Hand a blind child a plastic camel and she wont learn much about the animal. In fact she probably wont think it is a depiction of an animal at all. Why is it miniaturised? Why is it hard? Why doesnt it smell like an animal? Why doesnt it move or breathe or have fur or make any noise at all? The school should have small animals that are used to being handled, for children to learn what they really are. Where possible, there should be visits to zoos or visits to the school by mobile zoos. Teachers have to learn to think differently to put across different concepts. Music is vital. 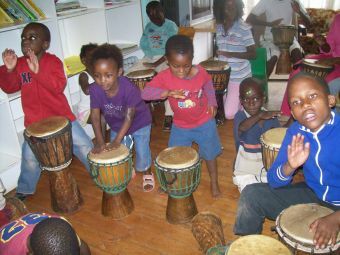 There should be instruments for children to play  from large wooden xylophones and drums, to pipes and whistles and home-made instruments. Acoustics of the whole school are important. A blind child listens to other peoples footsteps and listens where she walks herself. Feely walls; Trailing walls; sensory rooms and rooms that demonstrate cause and effect stimulation for young children, are all needed. Take a thick piece a cord  like that used to tie around curtains for decoration or heavy fabric piping for sofas, and stick it on a wall, going up and down so that a child following it with his hand, will have to crouch and stretch. Make the cord go round at least three walls of a room. Along the way add a variety of interesting items  in terms of texture, shape, size, and if possible smell and sound as well. This feely wall will make blind children want to explore the room. Hang a piece of swimming pool netting from four corners of the ceiling. Hang different items from the netting. As the child pulls one item she will hear another item move or if she can see a little, she might see a shiny or sparkling item move. Furniture should remain in one place; even putting markings on the floor to help cleaners to keep to the system. A blind child uses proprioception to know where things are from previous experience. Blind children benefit from nature tables even more than sighted children. One needs seashells and sand and bottles of seawater and salt to lick and tapes of waves and seagulls to listen to, and buckets and spades, and even big bowls of water with pieces of wood floating on them. Live goldfish can be kept .. though they wouldnt cope with much handling  and fish can even be explained a little through the smell of goldfish food.. as it is flakes of dried fish. Children can eat fishcakes or similar on the day they learn about fish and the sea or rivers. Carpets have been made internationally where children can jump on different coloured squares to play music  one square, one note. The concept could be adjusted to include different textured squares as well. Staff and classroom assistants must be able to swim. 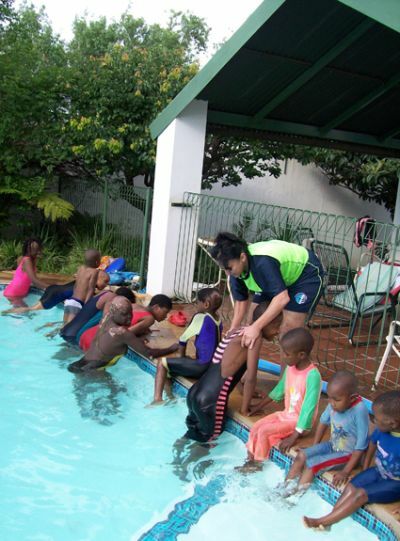 A pool is important as blind children need to learn to swim for their own safety but also because water is a very relaxing place for most disabled children to be. Working with play dough and real dough, learning how to cook simple food, use a sink, an oven, a stovetop, a fridge, etc are life skills that help all children and are also part of safety education. Children of Fire advocates acquiring a house in Melville, Auckland Park, Parktown or Westdene as these areas are close to its existing offices and make initial supervision much easier. Public transport to the areas is reasonably good. All the areas are also close to two universities, some other colleges and several state and private hospitals  all with staff who could support such a facility. A house with a swimming pool would be an asset for the pupils. It is envisaged in October 2002 that a suitable property might cost in the region of R700 000 but obtaining a disused Council facility might also be viable; even a disused church. A large property would allow for expansion but would have higher rates and other running costs, from the beginning. In theory the most logical answer would have been to expand facilities at TMI. But there are only two teaching staff there, neither with special training and, parents allege, neither with any noticeable interest in the work that they should be doing. They appear demotivated and one allegedly exhibits prejudice towards non-white children, particularly if they are disabled. One teacher had been trying for a considerable time to emigrate. The place does not function because it has two "masters" - health and education - and neither seems to know what the other is doing (or rather what they are not doing). There was a paediatrician there who has ignored the rights of disabled children and their families and carried out at least one insensitive and illegal medical examination that can be considered assault, as no prior permission was gained from the families and no explanation given to the child (children). 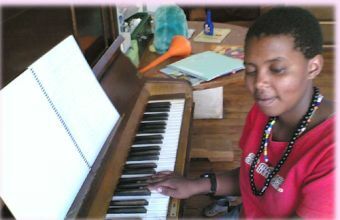 The School for the Blind in Johannesburg is needed now. Once premises are secured it would be easier to seek funding for all the many other aspects that would be needed - teaching staff, running costs, special equipment. Once well-established, the school should be run as a Section 21 company with its own governing body, though Children of Fire could maintain regular interest and input, and maybe have a seat on the governing body. November 2001; revised October 2002.